Rip rap is made from a variety of rock types, commonly granite or limestone, and occasionally concrete rubble from building and paving demolition. Much of Alameda's rip rap is remnants from freeways destroyed by earthquakes affecting San Francisco. It can be used on any waterway or water containment where there is potential for water erosion. [Wikipedia] The local winery, Rock Wall Wine Company, gets its name from the rip rap rock wall that surrounds Alameda. With our proximity to the San Francisco Bay, it's no surprise that a recent article in Oakland Magazine, "Climate-Change Denial in Alameda," caused some concern among our residents. It was brought up during the homeowner's open forum portion of our recent board meeting, so I decided to take some measurements and perform some rough calculations. Using a tape measure, the rip rap is 18 feet from the top to the bottom. Using the Pythagorean Theorem, that's a rise of 12.3 feet. Given an 18-foot rip rap, at low tide, the water is 12.3 feet below the top of the rip rap. High tides tend to fluctuate as a 5.8-foot increase. When this happens, the water is 6.5 feet from the top of the rip rap. A king tide is when the Earth, Moon, and Sun are aligned to result in the largest tidal range seen over the course of a year. King tides typically happen once a year around January 2 and tend to have a 7.3-foot effect. So during a king tide, the water level is 5.0 feet from the top of the rip rap. This makes sense since rarely do we see water even close to the top. The typical wave height in Alameda is 1.3 feet. Crown Harbor is fortunate that an adjacent community, Ballena Bay, has a breakwater that dampens the incoming waves. So even during stormy weather, waves are only in the neighborhood of 2 feet. One owner did relay a story about water coming over the top and to the doorsteps in 1988. That must have been one heck of a storm. Scientists have been warning for decades that many human activities increase atmospheric conditions of heating trapped gases, causing the planet to warm. Rising temperatures warm the oceans, which expand as temperatures increase, causing more polar ice to melt adding more volume to the ocean. 2016 was the Earth's hottest on record for the third consecutive year. Climate experts estimate that sea levels could jump as much as 8 feet by 2100 as ice sheets in Greenland and Antarctica sheer off and fall into the ocean. Sea levels rise of about 1 foot due to localized barometric pressure from storms. Long periods of atmospheric river (Pineapple Express) events could cause a temporary build-up in the bay of 0.5 feet. From these rough calculations, with normal conditions, Crown Harbor will experience its first issue at the first king tide in 2054. There will be issues at every high tide in 2070. Now in the case of a storm on the same day as a king tide after Pineapple Express conditions, a problem could arise as early as 2031. High tide on any stormy day is likely to produce a problem in 2047. For planning purposes, 2047 is a good target date since storms on the same day as a king tide after a Pineapple Express period are unlikely, but at least one stormy day per year is almost certain, and high tides on any day are for certain. 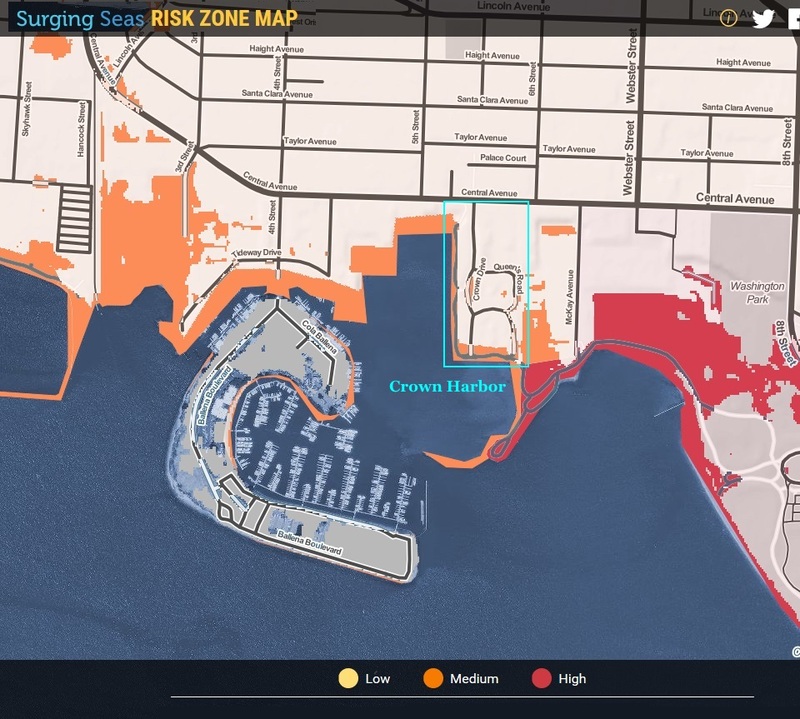 In 2015, FEMA (Federal Emergency Management Agency) identified several flood risk zones on Bay Farm Island (part of Alameda) and parts of Alameda's main island. According to the city of Alameda's analysis of the FEMA flood zone maps, 2,000 parcels of property in Alameda reside is what FEMA considers to be the 100-year floodplain, but FEMA floodplains are based on past flooding and not the dramatic seal level jump that climate experts predict. FEMA's maps showed heavily impacted areas that are adjacent to Crown Harbor. FEMA's estimates that there will be 1 foot to 3 feet of flooding, yet elevating homes in flood zones is often not possible due to height limits. According to a 2015 letter from the city to residents, "There is a 1 percent chance that in any one year, at-risk property will experience flooding from extreme high tides and storm activity." Other than a plan for Alameda Point (a new development area of the city), Alameda has yet to form any city-plans for sustainable solutions. Skeptics contend that FEMA's floodplain maps are an attempt to get more homeowners to purchase flood insurance to help recoup costs from Hurricanes Katrina and Sandy. The city of Alameda has decided to appeal FEMA's floodplain maps. The climate change problem will not be solved by Crown Harbor. As a group of 76 owners, the association can work with city of Alameda officials to do what we can to mitigate the problem; however, we have time. We need a solution in place by 2047. Thankfully, tools like Autodesk Insight 360 and Autodesk InfraWorks 360 are at the city of Alameda's disposal. Water level rising is alive in the lab.